In our days, the church is very much different from what it was in the past decades and even in the past years. The parishioners don’t only take part in the traditional prayers, they are also involved in a series of other activities that the church organizes. This is why the role of the pastor is much more complex, it involves carrying an extremely rich range of other activities. Besides holding services and taking care of the financial aspects related to the ministry, church leaders must also handle humanitarian aspects involving the permanent members or visitors of the church. These activities mean a lot of effort, but they can become much easier to organize if a specific, specially designed software application is used. With the use of pastoral software programs, church leaders gain efficient time management, while parishioners gain more time spent with the ministers. The programs are designed to fit churches in general, but some churches can decide to order special programs that can adjust their software to the specific needs of the church. In general, church management software applications are divided into a number of sub-programs which map to distinct activities: donation management, member management, accounting programs and so on. For a good ministry membership management, there are a few aspects to consider. First, pastors must know one history (such as the date of baptism, medical conditions, church attendance, donations, pledges, hospital visits or implication in different events), his or hers relations with family and other members of the community as well as the current contact details. Membership data can be managed differently by different churches, some preferring to create only individual profiles for members, other organizing profile information by families or groups (visitors, elders, suppliers). There are special programs called Church Directory Software which let you keep photo directories of church members so that you can easily link faces with names, especially if your church is large or expanding. 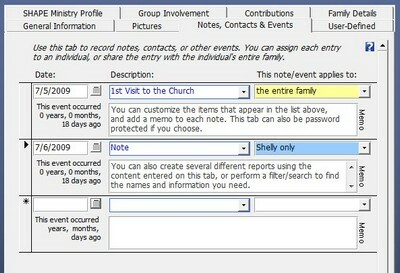 It is very convenient to have all information about church members in one place. Various applications offer different ways to store data, either in databases, lists or other forms of storage. Information about donations and pledges can be kept together with an individual’s profile, but sometimes separate modules are preferred. You can track contributions not only by member, but also by fund type (pledges, buildings, missions, general, etc). Many church software solutions moved to the Web in the past years. This adds flexibility and ease in the way church leaders and staff communicate with parishioners. A lot of information about the ministry’s activity and members can be posted on the church’s website for everyone to see; also, news and different events organized by the church can be announced on the website or sent to members by newsletters, so that they will stay informed at all times. To see what church membership software can really do for your ministry, what are the most popular features and their advantages, we have presented three different software solutions in the following paragraphs. The first solution is provided by ACS Technologies. They offer a number of tools for member management, the most important ones being described below. 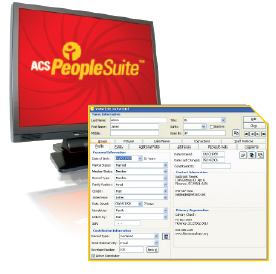 The ACS People is a powerful database management tool that helps you keep all personal information consistent and up-to-date. You can select the preferred level of security, keep an unlimited number of records which you can quickly access, group information by family unit or other user-defined category, import pictures from digital files or scanned images, produce charts or graphs on system-defined and user-defined fields and export them to other programs like Excel. Online groups within Access ACS is a dynamic communication tool which offers an easy way to give your church members and staff access to vital information over the Internet. As with any church growth software, this module will allow you to increase the outreach of your ministry and strengthen relationship within the community. Their growth modules offer simple ways to manage existing members and to attract new ones; so you can create reports with visit information for assigned individuals or mail merges to selected individuals to recognize faithful attendance or to encourage those whose attendance has dropped off. ACS Report Designer is an advanced reporting tool which lets users design and configure professional reports based on data from other ACS modules such as: People, Attendance, Contributions, General Ledges, Organizations, Connections or Special Mailings. You can purchase their products online here. Another popular membership management software solution is ChurchTrac. The software has a number of modules for people management, groups and attendance, follow-up, record keeping, giving, mailings and event schedulers. 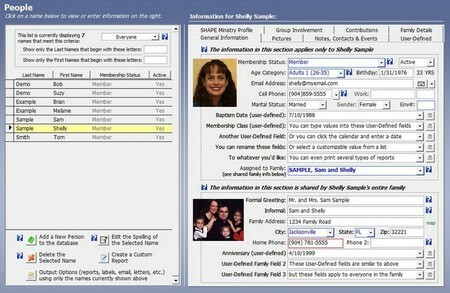 Besides the large database and photo directories, the program has various other great features, such as the SHAPE ministry profiles (a place to enter abilities, personality traits, experiences and other fields you might consider for each member in your congregation), create customized, user-defined fields, secure sensitive data with passwords, print maps (for visitors) or mailing labels for absentees, families, various groups or any other criteria you want. Download a copy free of charge from www.churchtrac.com/download_form.htm. An easy-to-use, professional and affordable membership management system comes from Working Church. The software is designed to help you track member or visitor contact details, church attendance, member contributions, print membership directories and member year-end tax statements and many more. You can request a free, fully-functional demo or buy the program at www.workingchurch.com/demo.html. If you want to get more advice about how to manage church data, members or donations using church software you can take a look at our featured article.